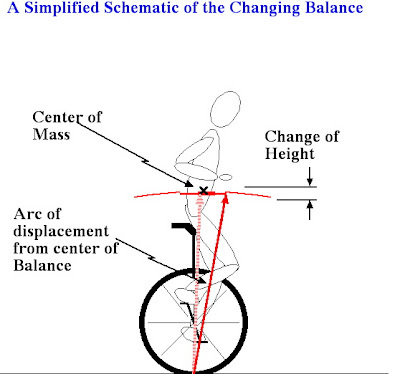 A reader sent me an interesting page on the energy requirements involved in unicycling. Quite simply put, two riders, one skilled and one less skilled, show different efficiencies operating the cycle. Skilled unicyclists devote more energy to going straight than they do trying to stay in balance through precise timing of corrective energy provision, while less skilled riders show the opposite scenario, which is why most of us lose out quickly and fall. To keep a unicycle in balance, a correcting energy has to be supplied at some frequency for proper dynamics of the system. As far as steering is concerned, the main aim of balancing comes from steering in the direction to counteract a lean. It will be interesting to study at what frequency skilled riders supply corrective energy to stay in balance. This is apparently done so that the small angular displacements lead to small energy expenditures. The estimation by the author is that 100 calories of energy is supplied by the rider per hour to aid in the balancing act. 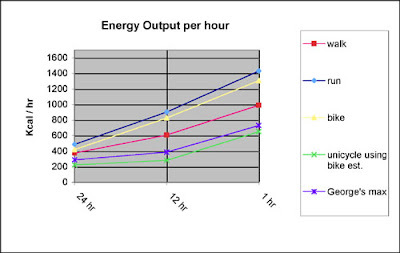 Energy output per hour of various means of movement - bicycling, unicycling, walking etc. The trick seems to be in finding the right balance between ranges for the angle of tilt the rider and his bike makes with the vertical. Too much an angle means you may go faster because of the squared relationship with gravity but it'll take more energy to raise your center of gravity up to the balance point. Too less an angle might mean you're perfectly in balance but you're moving slow. I haven't ridden a unicycle but I'm wondering what you guys think. How do you balance yourself? Efficiency In Inefficiency : Walk Or Pedal Up A Steep Hill?